Perfect for food and beverage operations. 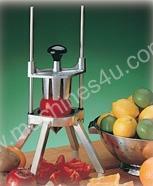 Works with lemon, lime, orange, potatoes, zucchini, tomatoes, etc. Available in 6, 8 or 10 sections.